Tonight has been chaotic and stressful. There’s been stomping, screaming, slammed doors and tears, (and that’s just from me.) Kidding, kidding! Oh how I wanted to though! But the sounds in my house are probably typical of any house with teens or kids running through them who don’t always see eye to eye with their parents. I’ll admit to it, and not try to paint you rosy pictures. I’ll not lie. Life isn’t ALWAYS rosy. As I stood in my kitchen leaning against my sink full of dishes yet undone, I let my head fall into my hands. I wanted to just let myself give into the feelings that were so expressively voiced by my daughter just moments ago, that of helplessness and more than a twinge of hopelessness. I had absolutely no idea what I was getting into when I gave birth to that precious girl nearly 14 years ago. But I can say this, I’ll fight for her for the rest of my life – come hell or high water. And I mean that down to the very core of my being. She’s amazing, even if she doesn’t know it yet! My dishes? They would wait… I sensed they wouldn’t go anywhere without me. Looking up through the ceiling I wove my way up to heaven and peeked in on God. I sat down on my worn dinette chair and whispered, “How many times have I come to YOU, God, ranting and raving, yelling at you with my fears and my self assured failures that’s left you holding your head in your hands? How much more must it hurt to be YOU and see us giving ourselves over to doubt, failure, and insecurity so quickly… all because it got really really hard one day.” I wondered to myself if I looked at all like my tear stained teen had, standing shaky and lost before me just moments ago. I imagined God came and sat in my kitchen with me. I imagined it not because it seemed interesting to imagine. I did it because it seemed incredibly insane. WHY would the God of the Universe want to sit in MY kitchen, on a Mad Monday night, with my sink of dirty dishes piled up and my tears brimming over? Why? Because like my best friend, (who unexpectedly showed up out of the blue, popped in, hugged the heck out of me when I really needed it, then popped back out…) He just cares THAT much. He wants to hear ALL of it. Even the crappy part of it that makes us cringe. He really wants us to take the time to tell Him. Not just the pretty moments that may seem we have our act all together. He knows the truth anyway. As we come upon Thanksgiving, everyone has things to be thankful for. Some of us have sweet and beautiful pictures to paint with our thanksgiving lists, and some of us may just be thankful for another day with food and a roof over our heads. The thing about God is that if you are just willing to sit in your kitchen, dirty dishes and all, and come to him and say, “Thanks for getting me through this day today,” God is blessed by your gratitude. Be thankful for the little things. Those are the things that make up daily life. Living grateful daily will allow Him to lead you to the bigger blessings along the way. Today, for me, it’s for God meeting me in a kitchen full of dirty dishes after a chaotic day and telling me He still believes in me. He still believes in you, too. I know because He told me so. 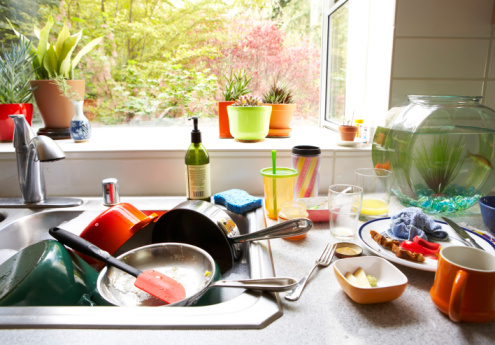 Great post on how the Lord can meet us anywhere, even at the kitchen sink. For some reason, when I see my dirty sink I can get depressed at all the stuff I have to do as a mom. But, now I look at it in a different light. Thanks for the insight! I am blessed my dirty dishes can bring insight! I was hoping to write an upbeat post but sometimes life is what it is… and God can meet us where ever that may be. Up days are not the only ones to be thankful in. Thanks for the read and comment! It seems clear to me that God sent your best friend to you tonight as an answer to your prayer! We call them “drive by Hugs” and I know it was a God thing – He is the only one who knew I needed a hug that bad. I hadn’t had the chance to tell anyone else. 🙂 And I didn’t need to. And THAT is amazing. He’s that big, and yet that personal. LOVE IT! He’s pretty awesome. I believe God IS with us IN those fragmented days when we often cannot see beyond those moments of being out of control and what needs to be accomplished. Often I cannot see past end of my nose. Then when I finally realize once again WHO IS in control, I somehow gain a peace when I let go and AGAIN give Him back the control that was already there.